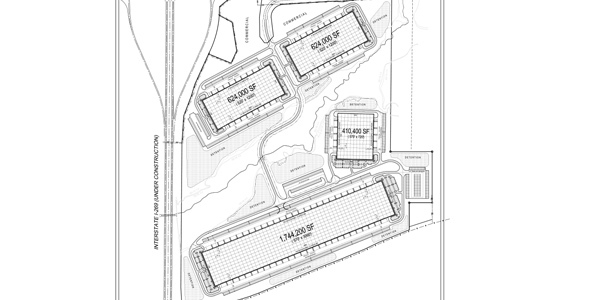 I-269 Logistics Center is 3.5 million square feet of proposed Class-A distribution and industrial space available for build-to-suit. Located at the intersection of Goodman Road and the Southeast corner of the new I-269 beltway, the site provides excellent access to I-55 , I-40 and I-22 into large consumer markets throughout the Southeastern US. Buildings available from 100,000 to 1.7 million square feet and ready 5 ± months from lease execution. Proposed property highlights include 32′ – 36′ clear height, 50′ x 54′ bays, 60′ running bays, high efficiency T-5 light fixtures, ESFR sprinklers and 7″ floor of 4,000 PSI unreinforced concrete. The site has foreign trade zone eligibility. 70% of the entire U.S. population can be reached within 48 hours. This entry was posted in Active Projects by Devon Byerley. Bookmark the permalink.